# The government consists of the King and the ministers. The King is inviolable; the ministers are responsible. The 58-year reign of Queen Wilhelmina was dominated by the two World Wars. She married a German prince, Duke Henry of Mecklenburg-Schwerin, who was not happy with his unrewarding role of husband-to-the-queen. Wilhelmina's strong personality and unrelenting passion to fulfill her inherited task overpowered many men in position of authority, including ministers, Prime Ministers and her own husband. She is mostly remembered for her role during World War II. The initial disappointment of many Dutch people because of her quick withdrawal to London faded (though it was never forgotten and by some was never forgiven) when she proved to be of great moral support to the people and the resistance in her occupied country[who?]. Hendrik and Wilhelmina had one daughter, Juliana, who came to the throne in 1948. They lived in The Hague and in Palace 't Loo (Paleis 't Loo) in Apeldoorn. She died in 1962. For her early reign and character, the letters of Queen Victoria give a good perspective. ^ a b c d e f Janse de Jonge, E.J. ; A.K. Koekkoek; et al. (2000). A.K.Koekkoek, ed. de Grondwet — een systematisch en artikelsgewijs commentaar [the Constitution — a systematic, article-by-article commentary] (in Dutch) (3rd ed.). W.E.J. TJEENK WILLINK. ISBN 90-271-5106-7. ^ van Bijsterveld, S.C.; A.K. Koekkoek; et al. (2000). A.K.Koekkoek, ed. de Grondwet — een systematisch en artikelsgewijs commentaar [the Constitution — a systematic, article-by-article commentary] (in Dutch) (3rd ed.). W.E.J. TJEENK WILLINK. ISBN 90-271-5106-7. ^ Beers, A.A.L. ; A.K. Koekkoek; et al. (2000). A.K.Koekkoek, ed. de Grondwet — een systematisch en artikelsgewijs commentaar [the Constitution — a systematic, article-by-article commentary] (in Dutch) (3rd ed.). W.E.J. TJEENK WILLINK. ISBN 90-271-5106-7. The present constitution is generally seen as directly derived from the one issued in 1815, constituting a constitutional monarchy. A revision in 1848 instituted a system of parliamentary democracy, in 1983, a major revision of the constitution was undertaken, almost fully rewriting the text and adding new civil rights. The text is very sober, devoid of legal or political doctrine and it includes a bill of rights. 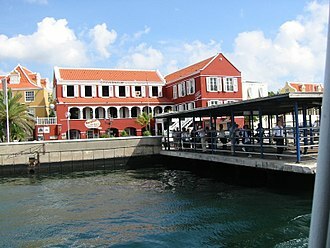 The constitution prohibits the judiciary to test laws and treaties against the constitution, there is no constitutional court in the Netherlands, except for the Constitutional Court of Sint Maarten which only governs the Sint Maarten legislator. The constitution was empowered by the Union of Utrecht, thus by treaty, Article XIII of the treaty granted each inhabitant of the Republic freedom of conscience. The Union of Utrecht treaty inspired the American Articles of Confederation, after the French invasion of 1794 the Batavian Republic, a unitary state, was proclaimed. On 31 January 1795 it issued a Bill of Rights, the Verklaring der Rechten van den Mensch en van den Burger, the Napoleonic Kingdom of Holland, a constitutional monarchy, was established by the Constitutie voor het Koningrijk Holland on 7 August 1806. In 1810 the kingdom was annexed by the French Empire and it included a limited unentrenched bill of rights, with freedom of religion, the principle of habeas corpus, the right of petition and freedom of the press as its main points. In the Treaty of London of 1814 the Allies had ordered that the original Dutch state would devise the new constitution and it had been approved by the new States General of the Northern Netherlands, but rejected by the majority of appointed electors of the Southern Netherlands. In all the administration was very monarchical, with the king appointing for life the members of the Senate, the First Chamber, that mockingly was called the Ménagerie du Roi. In 1840, when a new revision was necessary by the independence of Belgium. The constitution as it was revised on 11 October 1848 is often described as the original of the still in force today. Parliament was accorded the right to amend government law proposals and to hold investigative hearings, the States-Provincial, themselves elected by the voter, appointed by majorities for each province the members of the Senate from a select group of upper class citizens. The cabinet of the Netherlands is the main executive body of the Dutch government. The current cabinet of the Netherlands is the Second Rutte cabinet, the cabinet consists of the ministers and state secretaries. The cabinet is led by the Prime Minister, for instance there has for some time been a minister for development cooperation, who works within the ministry of Foreign Affairs. Most ministries have a secretary who is responsible for part of the relevant portfolio. Most significantly, state secretaries are not members of the Council of Ministers, the policy of a cabinet is coordinated by the Council of Ministers, in which all ministers, including ministers without portfolio, take part. The Council initiates laws and policy, State secretaries do not attend the Council of Ministers unless invited, and even they have no voting rights in the Council. The Council meets every Friday in the Trêveszaal in the Binnenhof, meetings are chaired by the Prime Minister, or an acting Prime Minister if necessary. The Council makes decisions in a manner, all ministers. Behind the closed doors of the Trêveszaal, ministers can freely debate proposed decisions, once a decision is made by the Council, all individual members are bound by it and are obliged to support it publicly. A member of Cabinet who is not prepared to support a decision of the Council is obliged to step down. Typically, a deal of effort is put into reaching relative consensus on any decision. A process of voting within the Council does exist, but is ever used. Together with the King, the Council of Ministers forms the Government, in practice, the King does not participate in the daily decision-making of government, although he is kept up to date by weekly meetings with the Prime Minister. It should be noted that the Dutch constitution does not speak of cabinet, the ministers and collectively, are responsible to the States-General for government policy and must enjoy its confidence. It is not possible for a minister to be a member of parliament, Ministers or state secretaries who are no longer supported by a parliamentary majority are expected by convention to step down. Catharina-Amalia, Princess of Orange, is the heir apparent to the throne of the Kingdom of the Netherlands, consisting of the countries of the Netherlands, Curaçao, and Sint Maarten. Princess Catharina-Amalia is the eldest child of King Willem-Alexander and Queen Máxima and she became heir apparent when her father ascended the throne on 30 April 2013. Princess Catharina-Amalia Beatrix Carmen Victoria was born at 17,01 CET on 7 December 2003 in the HMC Bronovo in The Hague, as the first child of the then-Prince Willem-Alexander and Princess Máxima. On 12 June 2004, Catharina-Amalia was baptised by Reverend Carel ter Linden in the Great Church in The Hague, Princess Catharina-Amalia has two younger sisters, Princess Alexia and Princess Ariane. She lives with her parents and sisters in Villa Eikenhorst on the estate De Horsten in Wassenaar, the family will move to Huis ten Bosch in The Hague in the future. Since 10 December 2007, Catharina-Amalia has attended the primary school Bloemcampschool in Wassenaar. He is the de facto head of government of the Netherlands and coordinates the policy of the government. The current prime minister is Mark Rutte, although he is the most important political figure in the Netherlands, the Prime Minister is not as powerful as his British and German counterparts. This is mainly because, due to the Dutch system of proportional representation, the government is always a coalition between two or more parties. Because of his powers, the prime minister is described as primus inter pares. As a result of the review of 1983, the position of Prime Minister was inscribed into the Dutch constitution for the first time. According to the constitution, the Government is constituted by the King, the constitution stipulates the Prime Minister chairs the council of ministers and is appointed by royal decree. The royal decree of their own appointment and those of the ministers are to be countersigned by the Prime Minister. The Prime Minister chairs the meetings of the council of ministers and has the power to set the agenda of these meetings. The prime minister is Minister of General Affairs, which takes an important role in coordinating policy and is responsible for the Government Information Service, the Prime Minister is responsible for the royal house and has a weekly meeting with the King on government policy. Informally the Prime Minister functions as the face of the cabinet to the public, after the meetings of the cabinet on Friday, the Prime Minister hosts a press conference on the decisions of the cabinet and current affairs. The Prime Minister has functions in international affairs, attending the European Council every six months. The Prime Ministers office is a hexagon shaped tower, named The Little Tower Het Torentje on the Binnenhof in The Hague, the official residence is the Catshuis. Conventionally, the party with the largest number of seats in the Second Chamber will initiate coalition talks after elections and these negotiations are concluded by means of a so-called government agreement. He or she usually appoints her/himself Prime Minister, a minister from the smaller coalition party usually becomes Deputy Prime Minister of the cabinet. Huis ten Bosch is a royal palace in The Hague in the Netherlands. It is one of three residences of the Dutch Royal Family, the other two being Noordeinde Palace in The Hague and the Royal Palace in Amsterdam. A replica of the palace was built in Sasebo, construction of Huis ten Bosch began on 2 September 1645, under the direction of Bartholomeus Drijffhout, and to a design by Pieter Post and Jacob van Campen. It was commissioned by Amalia von Solms, the wife of stadtholder Frederick Henry, the first stone was laid by Elizabeth of Bohemia. After her husbands death in 1647, Amalia dedicated the palace to him, the dining room was designed by Daniel Marot. Over the next century and a half, the palace would change possession from the Nassau family, the king of Prussia and they gave the palace to the Batavian people who still own it to this day. The National Art Gallery, predecessor of the Rijksmuseum, was housed in the building from 1800 to 1805, napoleon Bonapartes brother, king of Holland, briefly lived in the palace between 1805 and 1807. This figure shows the seat distribution in the Dutch House of Representatives from the first general elections after the First World War (1918), to the current situation. The left wing parties are on the bottom, the Christian democratic parties in the center, with the right wing parties closer to the top. Occasionally one issue parties have arisen that are shown at the extreme top. Vertical lines indicate general elections. A plaque commemorating the actions of William II during 1848. The Hague's Binnenhof. The Ministry of General Affairs, where the Council of Ministers meets every Friday, is in the centre.